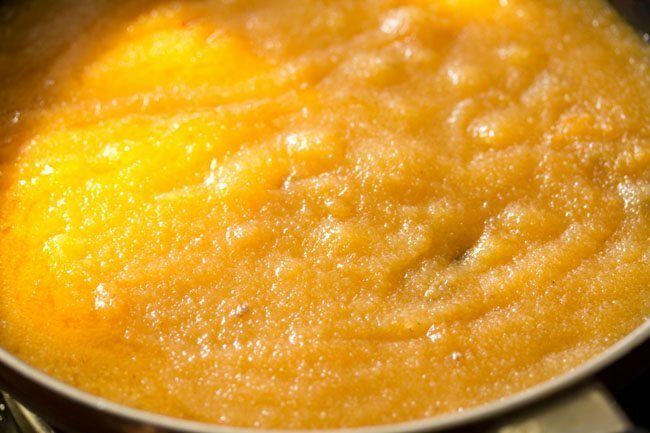 kesari bath recipe with step by step photos – a quick and easy to prepare rich sweet dish with rava or sooji. 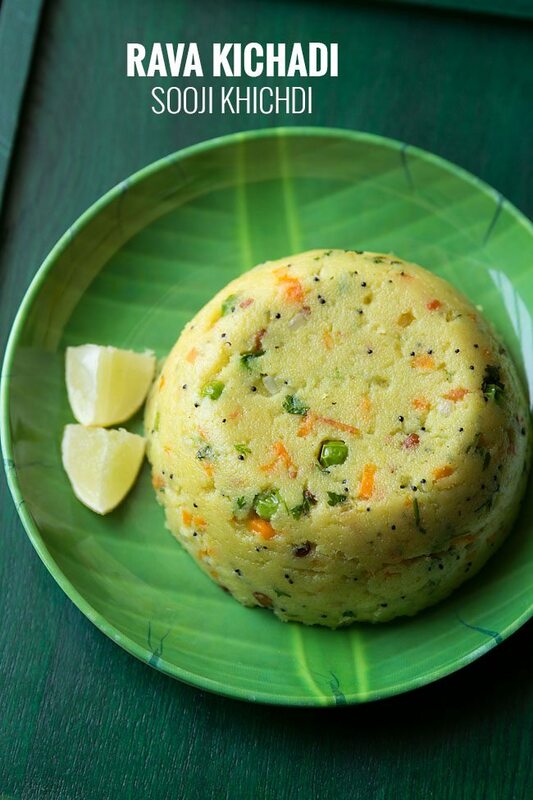 the recipe shared here is the karnataka style version of preparing kesari bhath. there are a few variations in the method of preparing this dish. 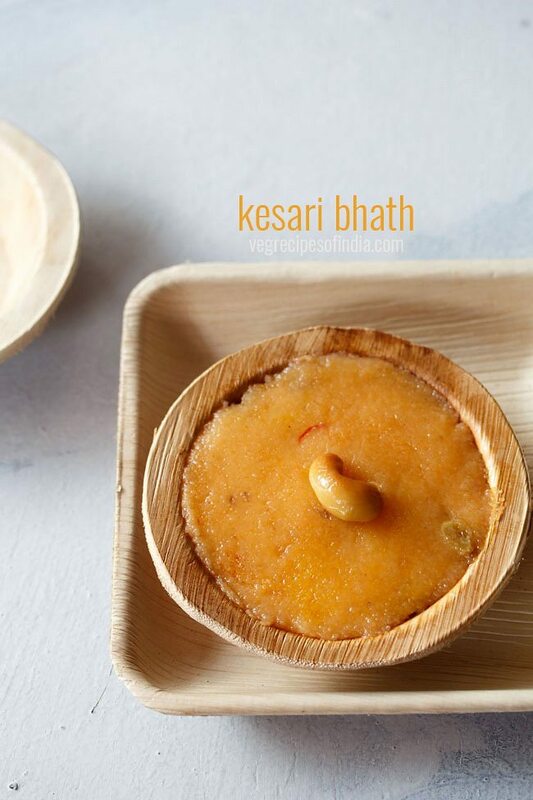 the recipe method shared here in this post is an easy method and gives a smooth velvety melt in the mouth kesari bath. since we lived in bangalore for some time, one special bangalore breakfast item that we loved was chow chow bath. 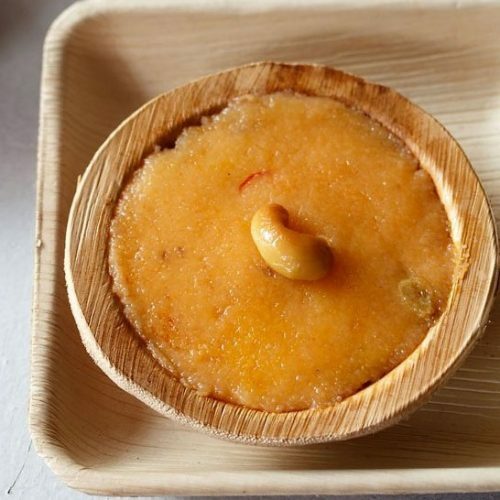 in chow chow bath, khara bath (rava kichadi) which is a savory dish and kesari bath, which is a sweet dish are served together with coconut chutney. 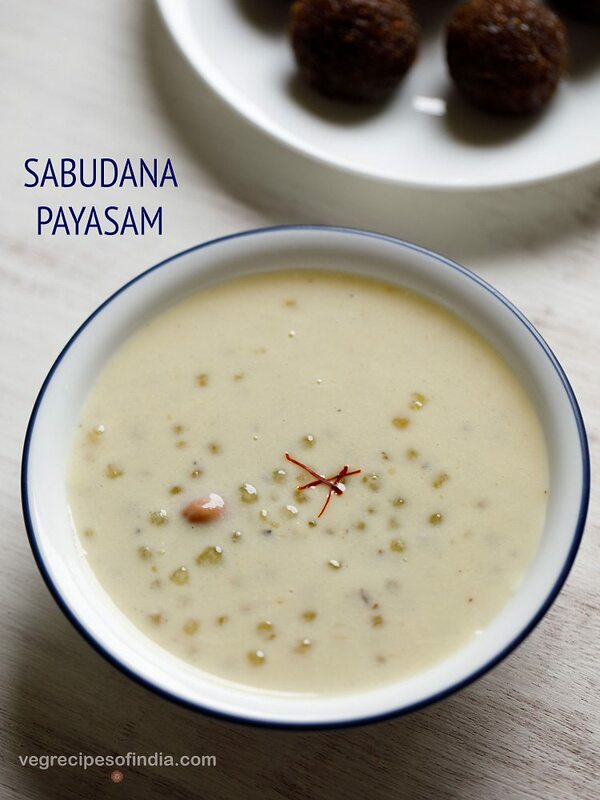 now one must try having both these dishes together with coconut chutney. chow chow bhath tastes so good and will also become one of your favorite breakfast. the word kesari means orange. so this silken sweet pudding has orange color. some even have a bright yellow color. the orange color comes from adding food color. usually in the restaurants and hotels, they use artificial colors. i suggest to use natural color extracts or natural coloring ingredients like saffron or turmeric. if using turmeric, then just add a pinch of it. 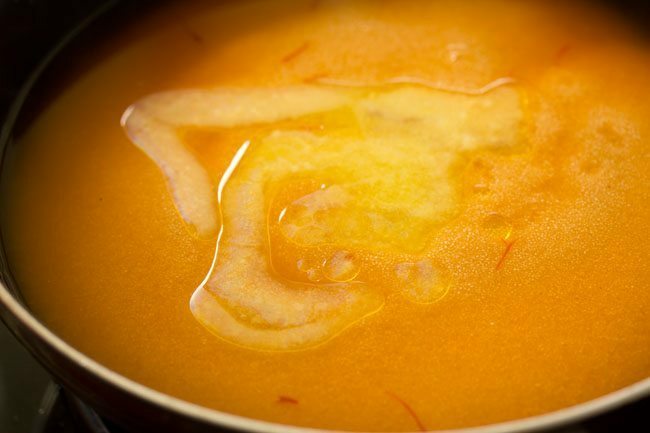 in the recipe to get the orange color, i have used saffron and a natural orange color extract. 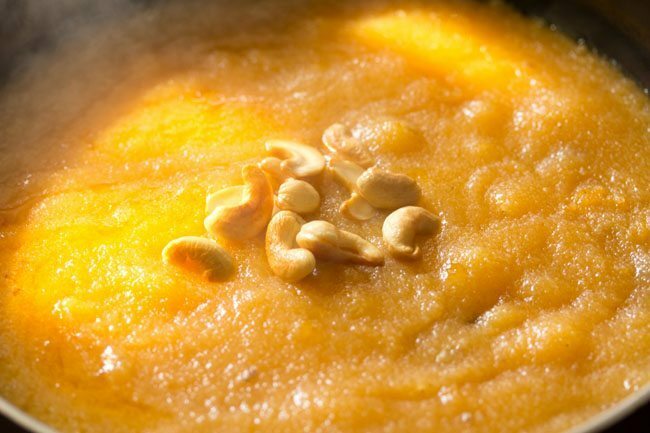 kesari bath is quick to prepare and just takes about 20 minutes. 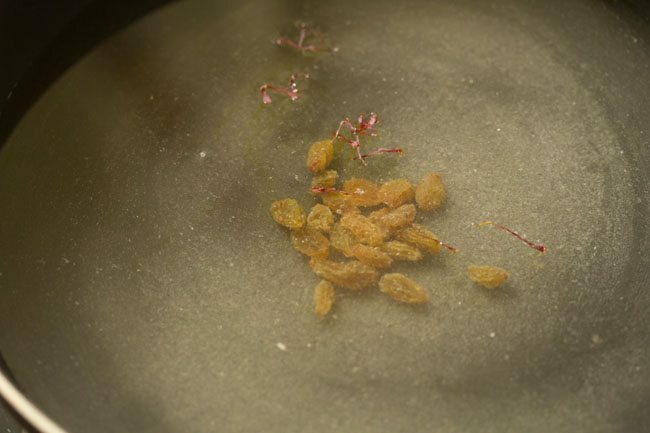 it can be served as breakfast or sweet snack or as a dessert after meals. ⅓ cup sugar OR 60 grams sugar OR you can add ½ cup of sugar for more sweeter version. heat a pan first. keep the flame to a low and add ½ cup fine rava (sooji or cream of wheat). stirring often roast rava on a low flame. roast till the rava becomes fragrant and looks crisp. takes about 5 to 6 minutes on a low flame. then switch off the flame. take all the roasted rava in a plate. in the same pan, heat ½ tablespoon ghee. stirring them often on a low to medium flame fry till they get golden. keep aside. 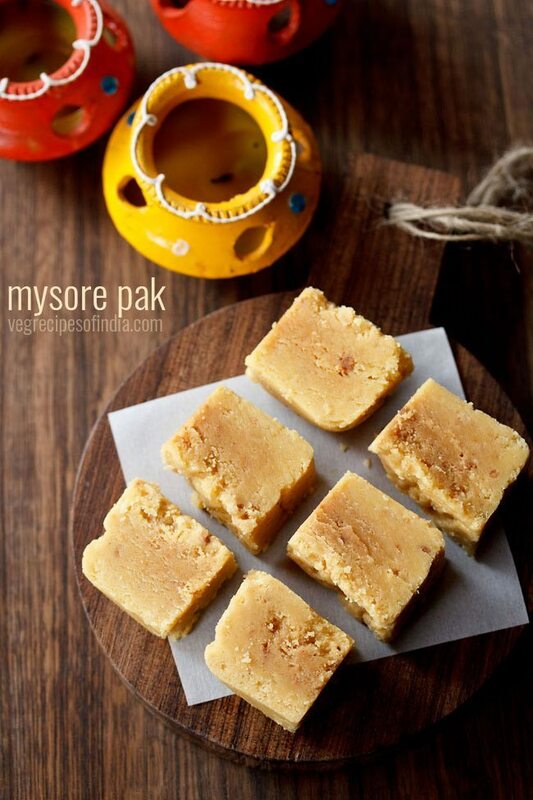 reserve this ghee to be added later in the kesari. 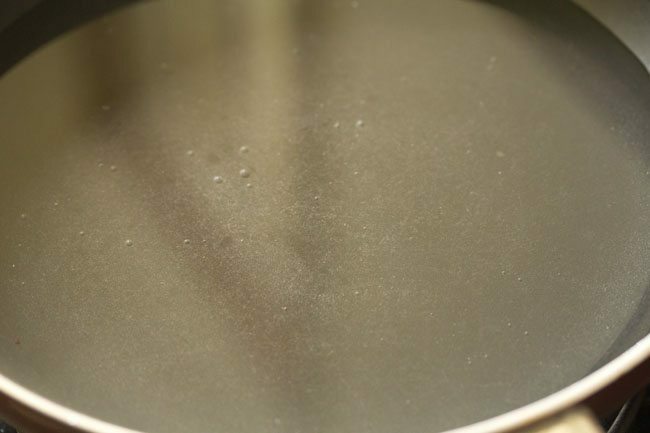 in another thick bottomed pan or kadai, take 1.5 cups water. add 1/3 cup sugar (60 grams). 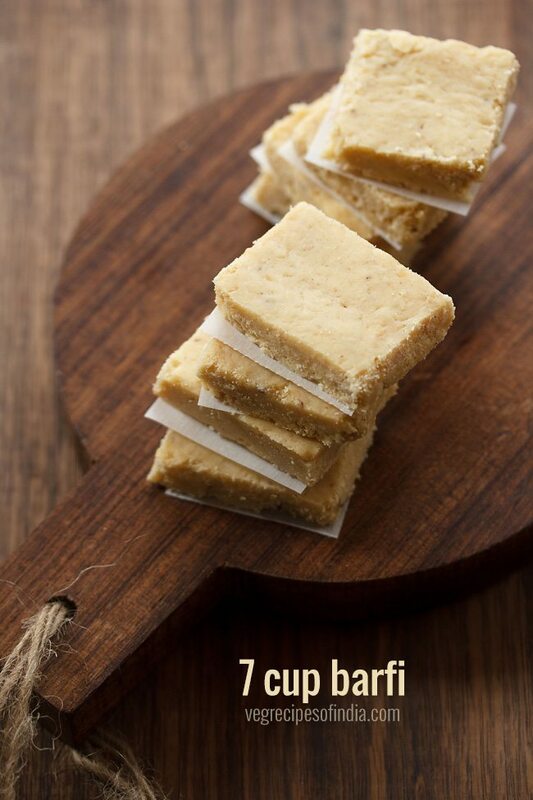 you can also add 1/2 cup sugar for a more sweet taste. 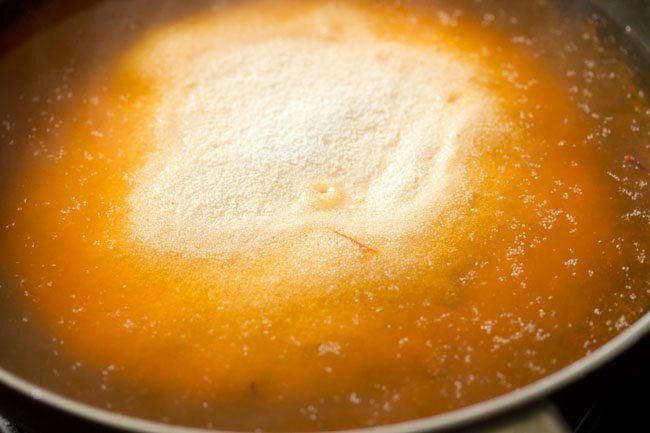 keep the pan on a low flame and stir very well, so that the sugar dissolves. add raisins and a pinch of saffron strands. i have added raisins in the sugar solution and they do soften up while cooking. if you want you can even fry the raisins with cashews. add 1 to 2 drops of natural food color extract if using or else skip it. mix very well. 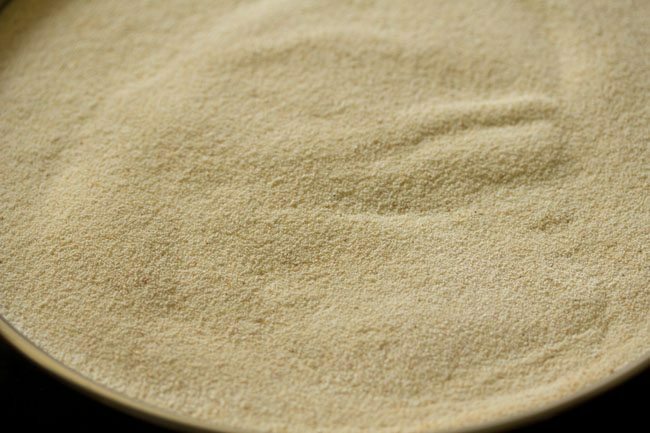 on a low-medium flame bring this sugar solution to a boil. when it comes to a boil, then lower the flame. add the roasted rava in 2 to 3 batches. first add one batch and quickly stir so that no lumps are formed. continue to add the remaining batch of rava and mix very well. 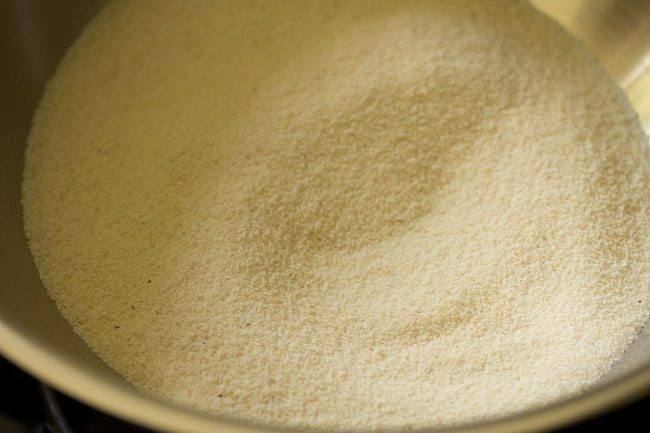 add 1.5 to 2.5 tablespoons ghee & 1/4 teaspoon cardamom powder. 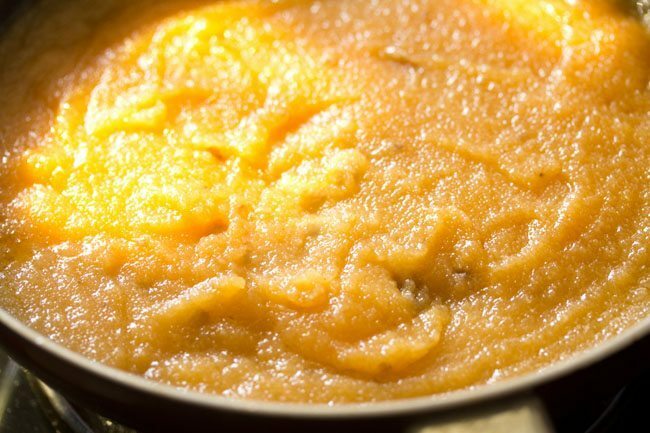 mix very well, so that the ghee is distributed evenly in the kesari bath. cover the pan and on a low flame or sim let the mixture cook. the rava will absorb all the water and cook. 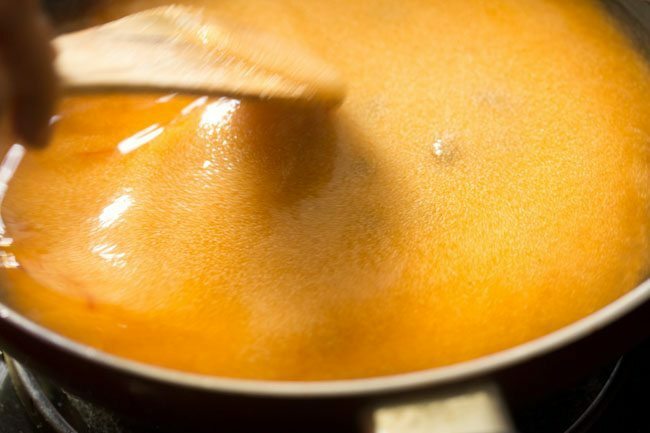 the mixture will also thicken. you should not see any whitish or creamish tiny specks on the rava. if you see then this means that the rava is still not cooked well. 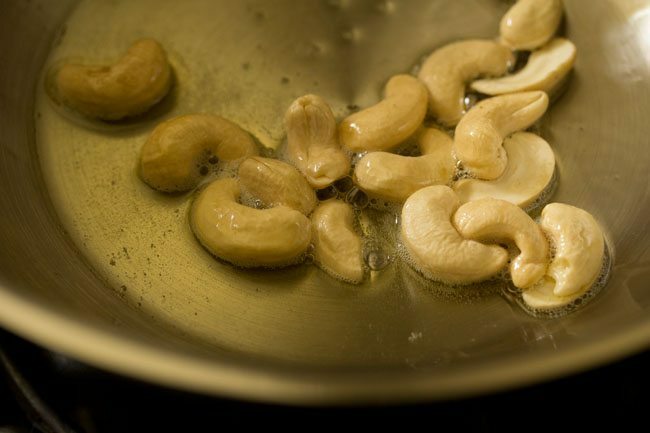 once the rava is cooked well then add the fried cashews. 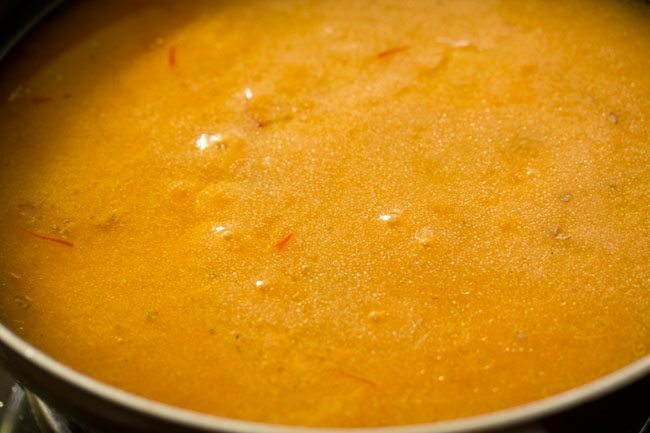 serve kesari bath hot or warm. you can also pour the kesari bath mixture in small to medium steel bowls or in small to medium tart moulds and let them become warm. once warm then unmold and serve. 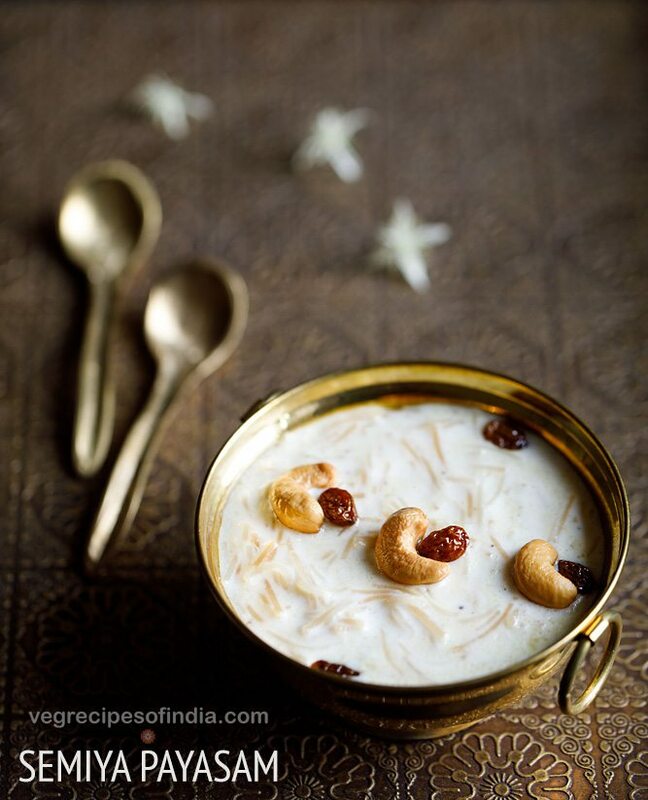 raisins can be fried along with the cashews and then added to kesari bath. 1. heat a pan first. 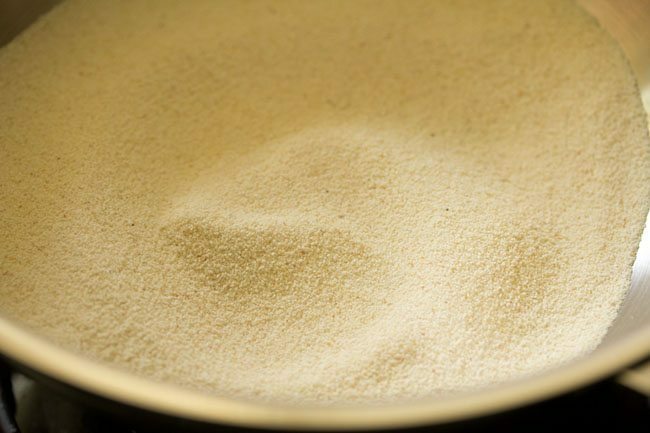 keep the flame to a low and add ½ cup fine rava (sooji or cream of wheat). 2. stirring often roast rava on a low flame. 3. roast till the rava become fragrant and looks crisp. takes about 5 to 6 minutes on a low flame. then switch off the flame. 4. take all the roasted rava in a plate. 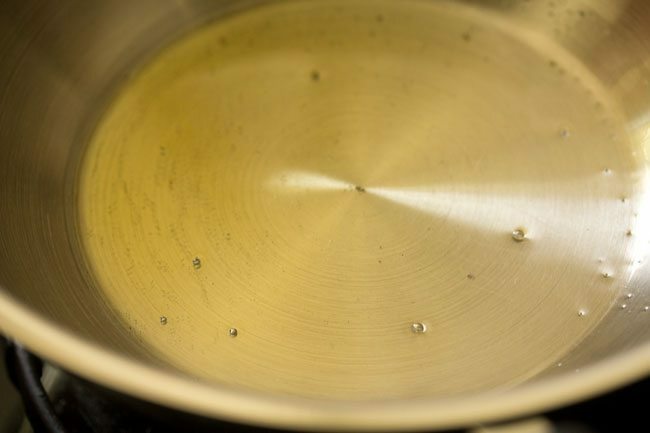 5. in the same pan, take ½ tablespoon ghee. 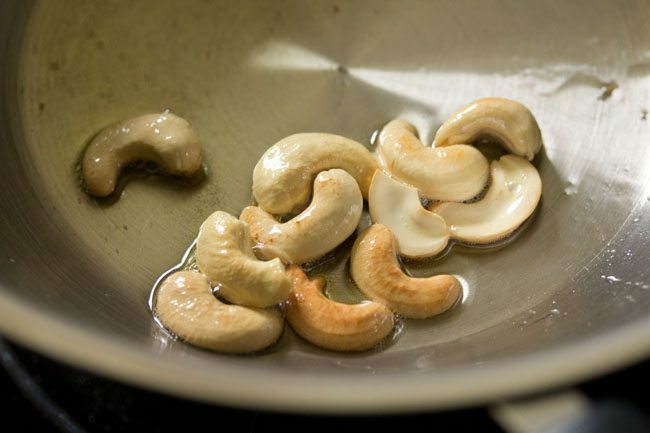 6. add 10 to 12 cashews. 7. stirring them often on a low to medium flame fry till they get golden. keep aside. reserve this ghee to be added later in the kesari. 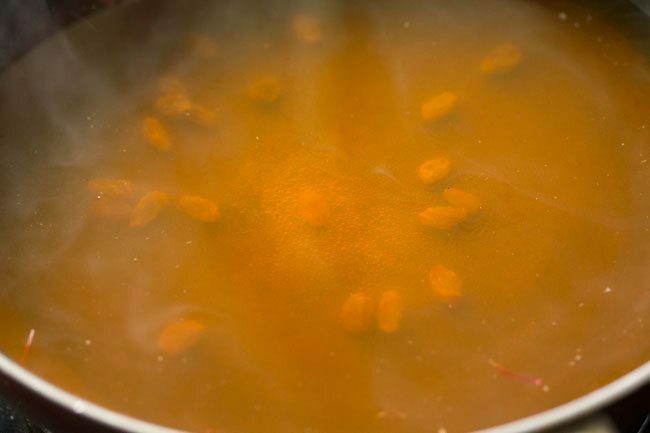 8. in another thick bottomed pan or kadai, take 1.5 cups water. 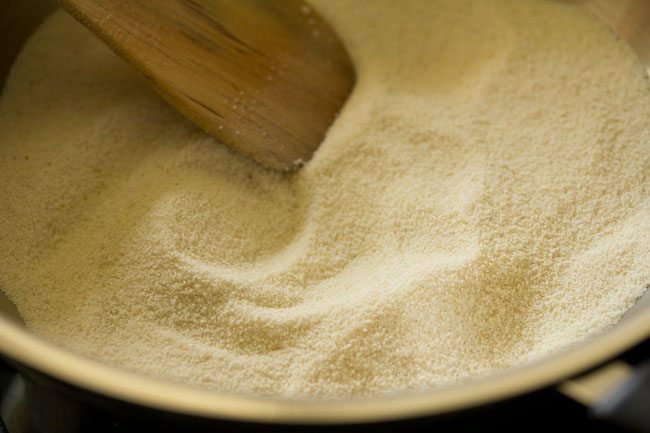 9. add ⅓ cup sugar (60 grams). you can also add ½ cup sugar for a more sweet taste. 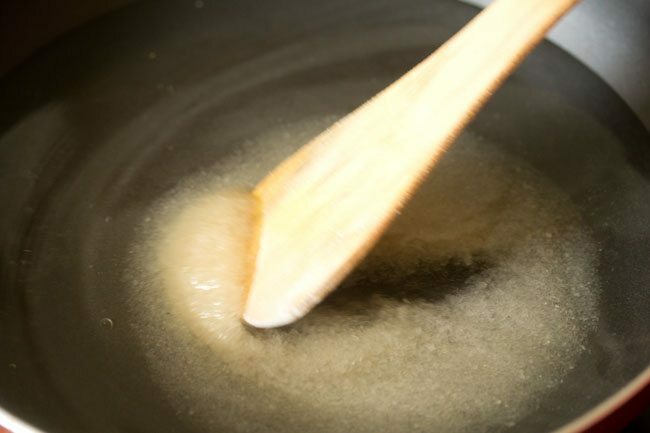 10. keep the pan on a low flame and stir very well, so that the sugar dissolves. 11. add raisins and a pinch of saffron strands. i have added raisins in the sugar solution and they do soften up while cooking. if you want you can even fry the raisins with cashews. 12. add 1 to 2 drops of natural food color extract if using or else skip it. or you can add a pinch of turmeric powder. 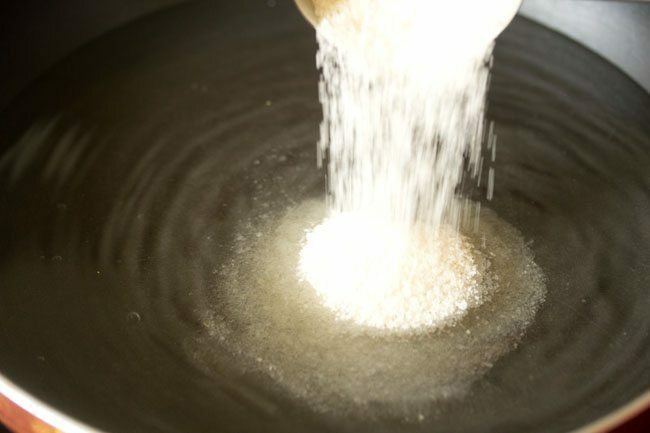 14. on a low-medium flame bring this sugar solution to a boil. 15. when it comes to a boil, then lower the flame. add the roasted rava in 2 to 3 batches. first add one batch and quickly stir so that no lumps are formed. 16. continue to add the remaining batch of rava. 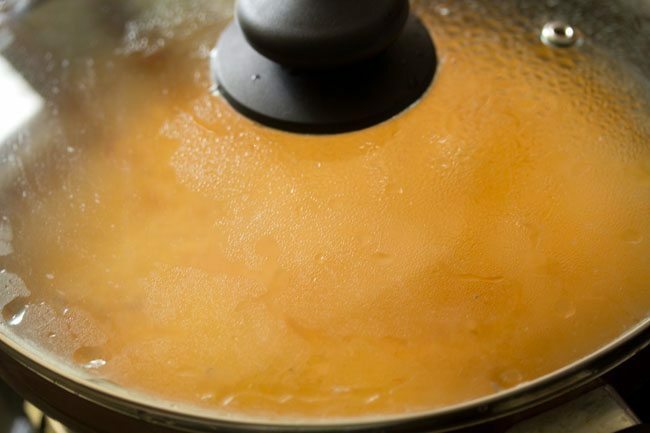 18. add the reserved ghee and 1.5 to 2.5 tablespoons ghee. 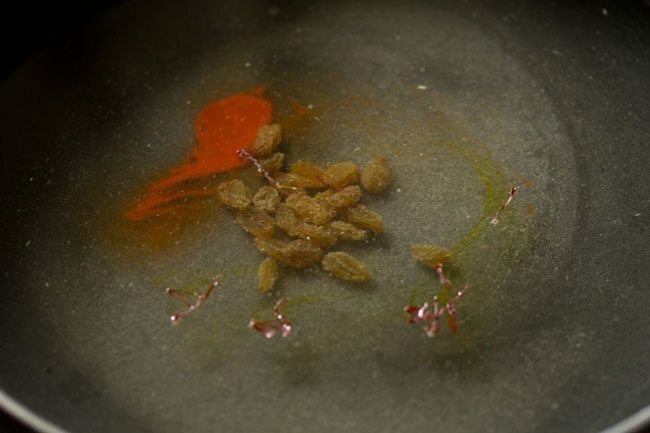 16. add ¼ teaspoon cardamom powder. 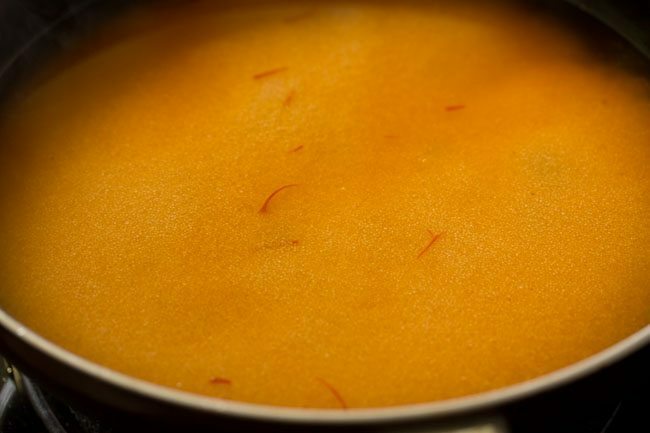 17. mix very well, so that the ghee is distributed evenly in the kesari bath. 18. cover the pan and on a low flame or sim let the mixture cook. 19. cook for 3 to 4 minutes. the rava will absorb all the water and get done. 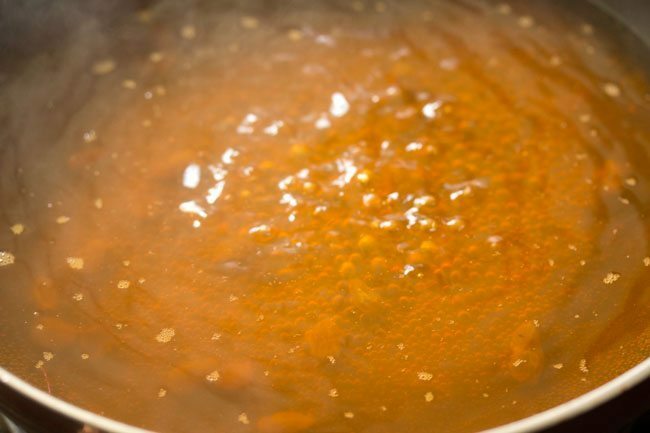 the ghee will also be absorbed and the mixture will also thicken. you should not see any whitish or creamish tiny specks on the rava. if you see then this means that the rava is still not cooked well. 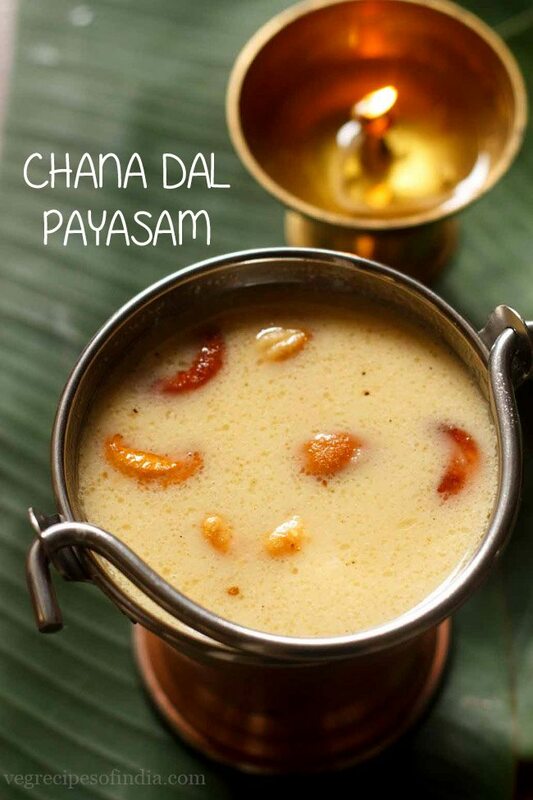 20. once the rava is cooked well then add the fried cashews. 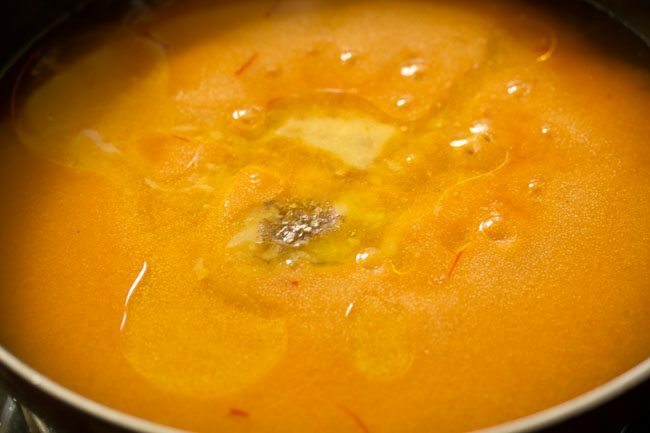 23. serve kesari bath hot or warm. 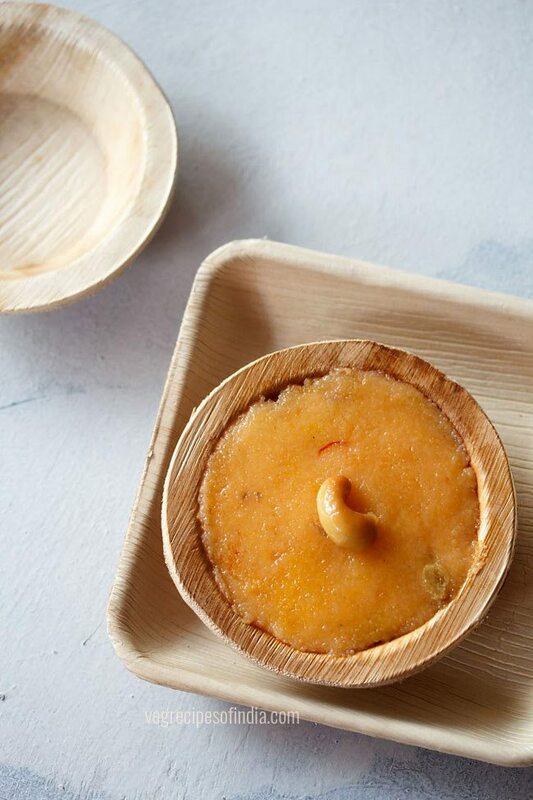 you can also pour the kesari bath mixture in small to medium steel bowls or in small to medium tart moulds and let them become warm. once warm then unmold and serve. thank you shree. thats great to know. 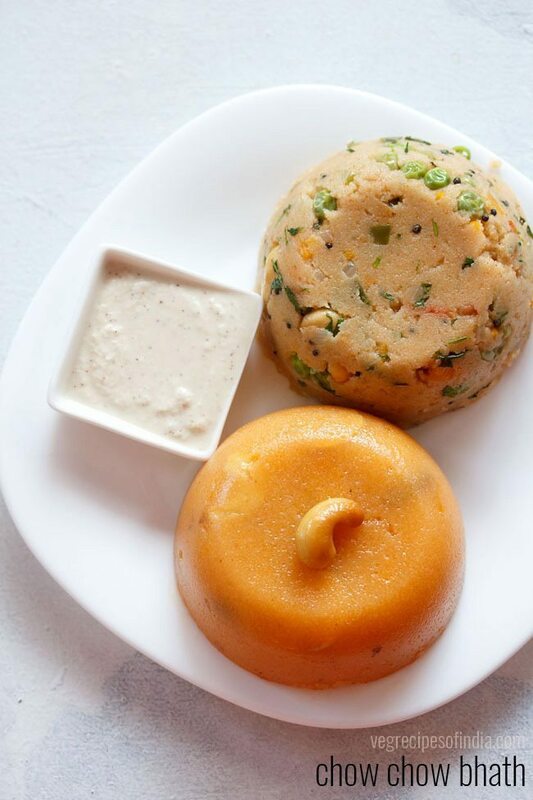 i love the prasad that they serve in temples and i do want to add all the famous prasad items that are served in various temples across india. of course, i will add puliyogare recipe too.